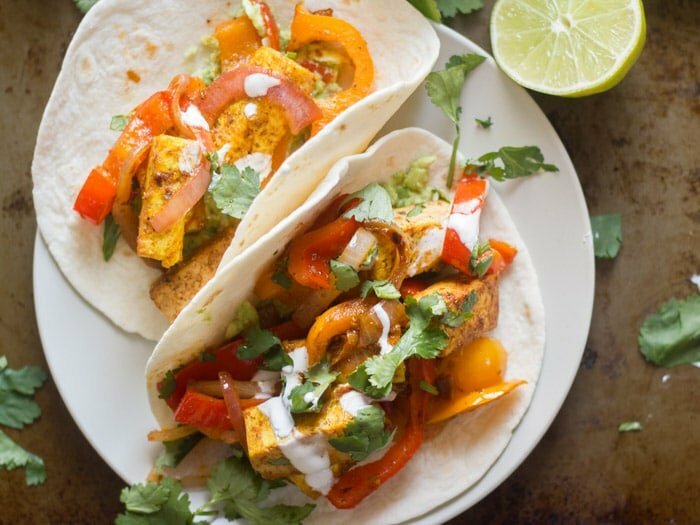 Tofu is pan-fried with peppers and onions, smothered in spicy sauce, and stuffed into warm tortillas to make these zesty vegan tofu fajitas. I can be a little unenthusiastic about fajitas. Oh, fajitas are lovely and all. 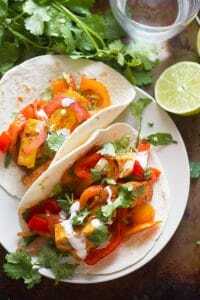 And these fajitas, well I’ll get down to telling you about their awesomeness later on in this post. I have a big issue with restaurant fajitas. Vegan and vegetarian restaurant fajitas in particular. (Obviously I have an issue with non-veggie fajitas, but that’s not the point.) I can’t even tell you how many times I’ve been to a restaurant, maybe a Mexican restaurant, maybe an all kinds of things restaurant, and they’ve got fajitas on the menu as the vegetarian option. That’s great and I totally appreciate them even offering something meatless. But the fajitas are inevitably disappointing. Most of the time they’re filled with just peppers and onions. Hey, I love peppers and onions, but a little more substance would be nice. Even if it’s just some mushrooms or a slathering of refried beans. So I set out to create a vegan fajita recipe worth getting excited about. What might make me jump for joy if I found it in my restaurant fajitas? Besides a big fat wad of cash, I mean? Okay, realistically, I don’t really expect any establishment that’s not super veggie friendly to offer veggie fajitas. 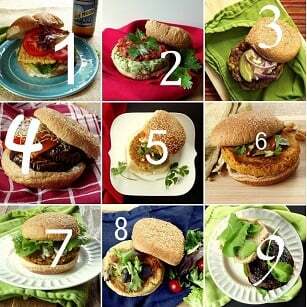 But my kitchen just happens to be super veggie friendly. 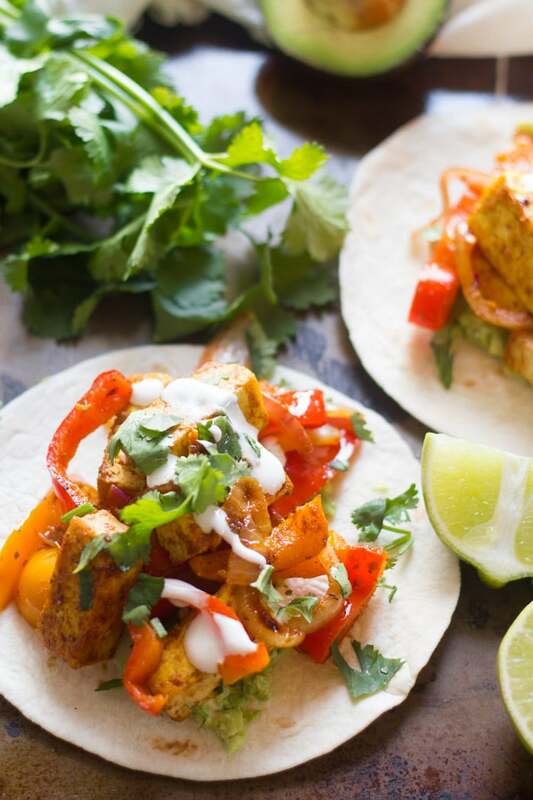 So I’ll be enjoying tofu fajitas a-plenty at home! 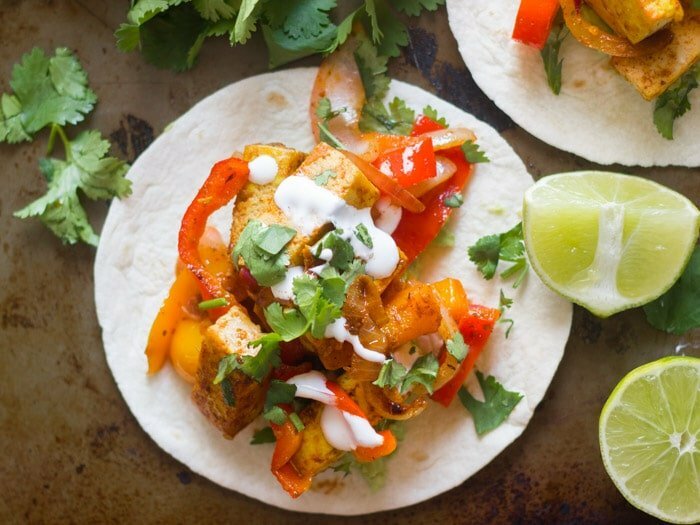 Tofu actually makes a great fajita filling. It’s very satisfying and soaks up spicy Tex-Mex flavors beautifully. 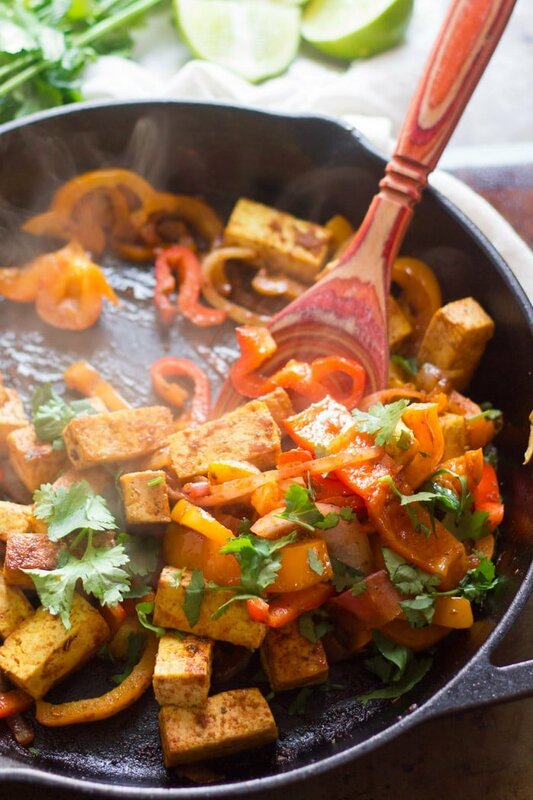 My initial thought was to make these as sheet pan fajitas featuring baked tofu. I actually had the oven on and my cookie sheets ready to go when I realized I was short on time. (Tofu takes about 40 minutes to bake!) So I decided to go with the much quicker method of cooking everything on the stove top, which is actually closer to how you’d make traditional fajitas. The trick is to pan-fry the tofu just like you might do for a stir-fry (details on that method here), then cook the peppers and onions super fast over high heat so they stay nice and crisp, and finally douse everything in sauce. The sauce cooks up quickly and most of the liquid evaporates, leaving a thin but super flavorful spicy coating on your tofu and veggies. Stir the lime juice, soy sauce, garlic, oregano, cumin, paprika, ancho chile powder, and black pepper together in a small bowl. Coat the bottom of a large skillet with the oil and place it over medium heat. When the oil is hot, add the tofu in an even layer. Cook for about 10 minutes, flipping once or twice, until the pieces are browned on multiple sides. Remove the tofu from the pan and transfer it to a plate. Raise the heat to high and add a dash more of oil to the skillet if it seems too dry. Add the peppers and onions, and cook, stirring frequently, until browned in spots and tender-crisp, 1-2 minutes. Return the tofu to the pan and pour the sauce over the tofu and veggies. Cook for 1-2 minutes more, until most of the liquid has evaporated. Remove from heat and stir in the cilantro. Stuff the tofu mixture into tortillas and top with salsa, cashew or vegan sour cream, and/or guacamole. Serve. I’m glad you enjoyed them!! Yay!! Glad you like them! Thanks Crystal!